Why fingerpicks? I guess why any picks. The first answer is of course, picks allow you to play louder. Also, picking long and hard without a pick can be rough on the flesh of your thumb or fingers. But for finger picks, there is a third reason. 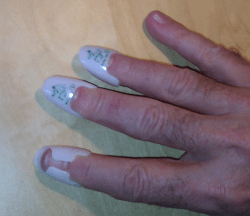 If you use your fingernails, they break. Fingerpicks prevent this problem. Plastic fingerpicks are inexpensive and sound good on guitar. They have two problems – at least for some people – like me. First, they are tricky to fit. If you find your plastic fingerpicks don’t fit well even after purchasing the size closest to your finger size you must form them to your finger. This requires carefully heating them in hot water until they can be easily be bent to your fingers shape. The tricky parts are to not over-cook them and to avoid burning yourself. Too much heat for too long a time and the picks will lose all shape. Burning yourself with hot water is a hazard I don’t think I need to detail. The second problem clearly doesn’t affect everyone. It depends on your finger and hand size and perhaps on what you are able to adjust to. The problem for me is the plastic is rather thick and this causes picks on adjacent fingers to get in each others way. I know that at least some people have the same problem, even with metal picks, because a banjo picker has made metal picks specifically to address this problem. aLaska fingerpicks have a unique design that is supposed to work more like your fingernail. You fingernail is supposed to slide over the plastic to hold the pick in position. As you see in the picture, they make both metal and plastic picks and they come in small, medium, large and extra large sizes. You can file the picking end to suit your preference and also file the inside edge that your fingernail fits over to it conforms better to the shape of your finger. I wanted to these to work but have never been able to get them to fit properly. If you buy these, check out their website’s fitting instructions. Many guitarists, myself included, have trouble initially making the transition from playing finger style with fingers alone to playing while wearing fingerpicks. The general advice that I will repeat is keep trying and you’ll get it. But some fingerpicks are easier to adapt to than others and one of the best for those making the transition are the ProPik fingertone picks. What is unique about this design is your fingertip can feel the strings as you play. 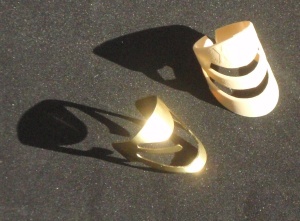 These come in a single and double wrap design (single or double bands that wrap around your fingers). Although better guitar stores may carry these, they are difficult to find online. You can get them atGuptill Music. You can also purchase them from Elderly Instruments. The classic metal finger pick is usually nickel plated steel. 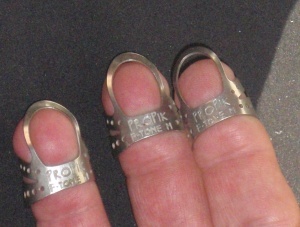 National metal fingerpicks are a good example. I usually think of these as banjo picks. I can’t find any examples among my pick collection so I’ve either misplaced or lost those I once had. As with flat picks, fingerpicks can have quite different tones depending on the shape and material. I’ve found that I like the sound of brass fingerpicks better than plated steel or even plated brass picks. I’ve also found I prefer some of the thinner gauges of brass pick. Dunlop offers brass picks in several gauges. I don’t find a big difference in sound of the thinner gauges but I like that the thinner picks are easier to bend to fit my fingers. You might have a hard time finding brass fingerpicks. Most of the better known big online music retailers don’t carry them – except for Elderly Instruments (one of my favorite stores). Fred Kelly makes picks. He has quite a few unique and useful designs for flat picks, thumb picks and finger picks. He and his wife make the picks and run their small business. I love some of his picks and recommend you taking a look at his website. Santa gave me a pack of 3 of the Fred Kelly Freedom Finger Picks. They are available in both Delrin and Polycarbonate. The concept is similar to the aLaska Finger pick in that the pick is a substitute for your fingernail rather than a substitute for the flesh of your finger. But the execution is quite different. I hope these will stay on my finger where the aLaska picks pop off. So far I like the idea but I will have to play with the sizing and maybe file the shape as well. One thing I’ve found is that you can reverse the intended orientation of the pick as I have on my first finger in the photo. The picks are intended to be worn as shown on my other two fingers – but you might want to experiment. Please watch the video if you’re interested in these. There are a number of specialty picks out there. You can buy metal finger picks for Dobro or lap steel guitar. These angle the point so it make better contact with the strings when holding the guitar in your lap. You can also get picks angled the opposite way which are claimed to be good for banjo or guitar. 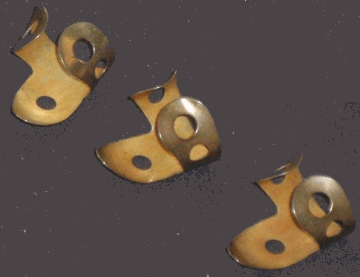 There are also many variations of metal picks aimed at banjo players. Although guitar players can uses these as well, if the picks come in a set there are usually only two picks included because this is the standard for banjo. Guitarists, on the other hand, are all over the place in terms of the number of fingers they use. Two fingers (plus thumb) is popular on guitar but so is three finger (as with classical guitarists) and one finger. I’ve heard of at least one guitarist who uses fingerpicks on all four fingers. The variations in pick design for banjo and other players include cobalt coated picks (smoother) and designs to make the picks fit better on the finger. Elderly Instruments has a good selection of fingerpicks. Take a look. It had never occurred to me that you could heat the plastic picks and shape them to your finger so thanks for the tip. Thanks for the suggestions of Butterfly picks. They look interesting. I hope to try them to compare to Pro-Pik, and other non-standard designs . Which of these would be easy to resize? Can you easily resize stainless steel picks. Sorry if I’m sounding stupid I just don’t know a whole lot about fingerpicks I’ve always used my nails. Metal fingerpicks can be bent to your finger size. But the thicker the metal, the more difficult it is to size the pick. I like the lighter gauge brass finger picks from Dunlop because they are easy to bend to fit your fingers. Classic style banjo picks, like the National, are more difficult to bend to your size. Plastic finger picks can be sized but it isn’t as easy. You have to soften the plastic in hot water or over steam and that can be dangerous if the water/steam is too hot. It is also a fine line between making the plastic soft enough to bend and so soft the pick loses all shape. Also, not all types of plastics can be softened and bent. For example, Delrin and Polycarbonate can’t be bent. ProPik Fingertone picks are a good metal pick if you are transitioning from bare fingers. The part that wraps around your finger can be bent to fit easily enough and the opening in the pick allows your finger flesh to feel the strings – almost like playing with bare fingers. All that said, nowadays I play with bare fingers more than 95% of the time. I use Dunlop .. and pro pick .. all in large size.. all too small … cant find xtra large… metal .. Getting frustrated should be so simple to find .. with plenty of wrap… like split for firmness but now dozens later halting unless dimentions stated not s.m.l.